It’s the second week of new Doctor Who and one Jodie Whittaker and her Time Friends are wandering an alien planet, fighting killer bedsheets and practicing Venusian aikido, and the news has not let up one jot. New TARDIS, new title sequence, new appearances, the Dreaded Stats return to menace Warren and delight Steven and Chris and a surfeit of tat, videos, Big Finish and more! This week on Radio Free Skaro, we’re looking to the future as the first wave of Gallifrey One guests get announced for 2019, Series 11 of Doctor Who wraps up filming, a new Thirteenth Doctor publicity photo emerges, and many a soundtrack (well, two) for Classic Who drops from the sky into your ears. And if that isn’t enough sensory overload, we have an interview with notable game merchants Susan and Lee Cummings as they discuss their upcoming Steam and mobile game, Doctor Who Infinity! And so we enter another fallow period as the Christmas special recedes into the dark recesses of 2016 but new Who has yet to arrive. What to do? How about diving deep into the history of Doctor Who with an interview with behind-the-scenes specialist and Twitter phenomenon @WhoSFX? Yes, you will listen to said interview! You will, or suffer the consequences! – Happy birthday William Hartnell! – Class debuts on BBC One tomorrow! – The Return of Doctor Mysterio final BBC One viewing figures! – Power of the Daleks in colour now at the BBC Store! Daleks! Cybermen! And Class! Yes, We’ve got news of “The Power of the Daleks”, which will make it to Canadian cinemas later than everywhere else (as is right and proper, or at least expected), and our (spoiler time stamped) review of Class Episode 3, “Nightvisiting”! But the main event is a look at the legacy of Cybermen creators Kit Pedler and Gerry Davis with Blue Box Podcast host J.R. Southall in…the Miniscope! NOTE: our discussion of Episode 3 of Class occurs from 5:35-23:30. It’s a little early to start talking about Gallifrey One’s next con in 2016..or is it? Not since tickets go on sale on May 4th (10 a.m. Pacific) and the Marriott’s block of hotel room goes on sale a week later on May 11th! And if the world’s greatest convention isn’t your thing, some sweet faux-Target novel covers of Series 8 stories might be to your liking. No? How about some superbly crafted pewter figures of Silurians? Old William Hartnell footage? Calgary Expo news? Not easy to please, are you? Fine, have an interview with Doctor Who composer Murray Gold, then, and hear him talk about creating music for Doctor Who in 2005 and in 2015, and also hear him reveal details about the upcoming Series 8 soundtrack. Ingrate. Radio Free Skaro #471 – Click here to listen! – Gallifrey One…2016 Ticket Sales! – Gallifrey One…2016 Hotel Block! – Andrew-Mark Thompson’s…Target Novelization Covers! – William Hartnell…In Johnny Come Home! – Arthur Darvill…At Calgary Expo! With Gallifrey One looming ever closer, the Three Who Rule looked far and wide for news, and found very little, other than the discovery of a lost Desert Island Discs from 1965 starring none other than one William Hartnell, and of course the long-awaited release of Seasons of War, the unofficial War Doctor Anthology in support of the Cauldwell Chirldren’s charity helping UK kids with autism. But all this was mere preamble to Color Separation Overlay, a new pilot project from Lindsey Mayers, and featuring Dennis Slade, Izis Mollinedo and our own Steven to talk about race and representation in Doctor Who. Put on your thinking caps and enjoy! Radio Free Skaro #459 – Click here to listen! – William Hartnell…Desert Island Discs! – Seasons of War…Short Film! The long, long wait is over. Doctor Who celebrated 50 years of thrilling us all with the adventures of a madman with a box in high style, with not only “The Day of the Doctor”, but also the stunning “An Adventure in Space and Time” and Peter Davison’s “The Five(ish) Doctors”, a whimsical treat for lovers of both the classic and new series. Let’s not forget that 94 countries and many movie theatres simulcast “The Day of the Doctor” on Saturday, and for the first time ever the Three Who Rule are able to relay what it felt like to watch a big-screen adventure with the Doctor(s) surrounded by the love of many, many fans cheering and whooping at every twist and turn. It was indeed a monumental week, but there’s still the Christmas Special and the end of Matt Smith’s run in a month, and next week a special RFS from Chicago TARDIS! Allons-Y, Geronimo, and for God’s Sake, GALLIFREY STANDS! Radio Free Skaro #394 – Click here to listen! – The Day…Of The Doctor! – The Day Of The Doctor…BBC Ratings! – The Day Of The Doctor…Deleted Scene! – The Day Of The Doctor…World Record! – Doctor Who Live…The After Party! – An Adventure…In Space And Time! – An Adventure In Space And Time…Ratings! The Three Who Rule welcome back our very good friend Chip from the Two-minute Time Lord podcast as we all talk over Neil Gaiman’s most recent Doctor Who effort, Nightmare in Silver. Has some time and distance since the story’s initial broadcast allowed our hearts to warm to it more, or was the extremely divisive reaction from fandom warranted and still valid? Will the effort satisfy 80s Hair Band pedants? News of the week, with Chip filling in for a very busy Warren, and which includes talk of what might just be the worst merchandise tie-in ever, rounds out this episode of Radio Free Skaro. Excelsior! Radio Free Skaro #381 – Click here to listen! – Doctor Who Magazine 464…Cover! – The Three Doctors…On Screen! – Christopher Eccleston’s…Message To The BFI! 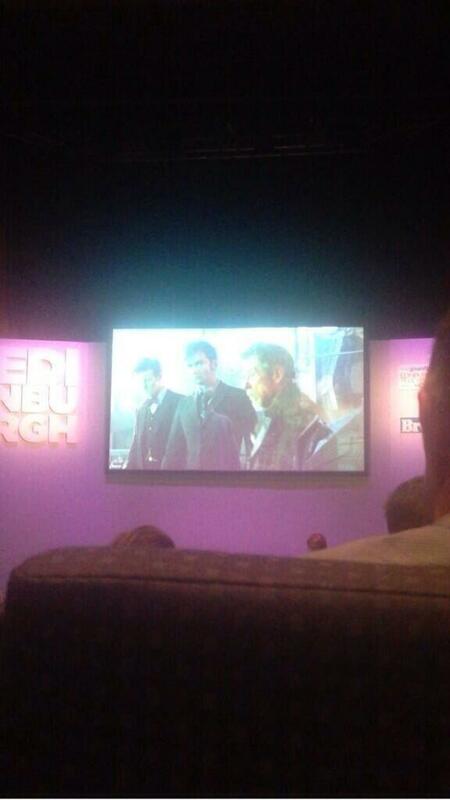 – Future Doctor Who BFI Screening…Details! – Peter Jackson Rumours…Just Won’t Die! – 2013 Doctor Who Prom…BBC One Transmission! – The Light At The End…Hipster Release! – Talking Sonic Screwdriver…Pizza Cutter?!?! – Guinness World Record…For Daleks!